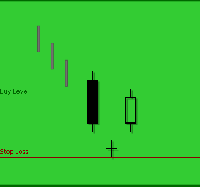 Candlesticks are graphical representations of price fluctuations for currency pairs. 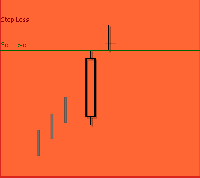 This is a three candlestick pattern signaling a major bottom reversal. It is exactly the same as the Bullish Morning Doji Star with one important difference. 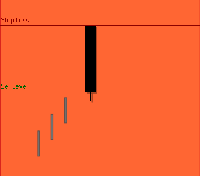 The shadows on the Doji must also gap below the shadows of the first and third days. Its name comes from the second day of the pattern which floats out on the chart by itself like an abandoned baby of the first and third days. Basically the pattern consists of a black candlestick followed by a Doji that gaps away (including shadows) from the prior black candlestick and the following white candlestick whose closing is well into the first black body. 1. The market is characterized by a prevailing downtrend. 2. A black candlestick is observed on the first day. 3. 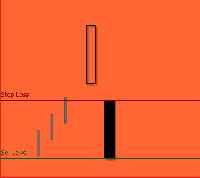 Then we see a Doji on the second day whose shadows gap below the previous day?s lower shadow. 4. Third day?s white candlestick gaps in the opposite direction with no shadows overlapping. The Bullish Abandoned Baby should start with a black candlestick that is not short and it must continue with a Doji that makes a gap away from the prior candlestick (including shadows). The third day of the pattern is a white candlestick. 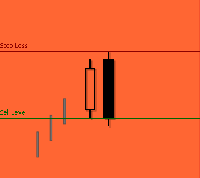 The gap between the low of this candlestick and the high of the Doji may be ignored. 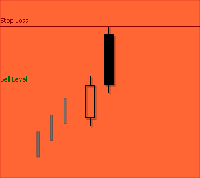 The white candlestick must close well into the black candlestick that appears at the beginning of the pattern. The extent of how high this candlestick must close is defined according to the other candlesticks belonging to the pattern. The third day?s closing must reach the midpoint between the first day?s opening and the second day?s lowest body level. A black candlestick confirms the continuation of the downtrend that is in progress. 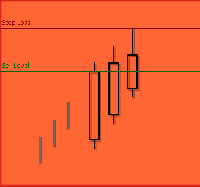 The appearance of the Doji that causes a huge gap indicates that the bears are still pushing down the price. The tight price action between the open and close shows indecision and reflects deterioration in the prior trend. In the third day the body of the candlestick is above the previous day trying to cover some of the ground from the down day. The confirmation level is defined as the last close. Prices should cross above this level for confirmation. The stop loss level is defined as the lower of the last two lows. Following the BUY if prices go down instead of going up and close or make two consecutive daily lows below the stop loss level while no bearish pattern is detected then the stop loss is triggered. This pattern consists of three consecutive white candlesticks with consecutively higher closes in an uptrend. 1. The market is characterized by a prevailing uptrend. 2. A white candlestick appears on the first day. Bearish Belt Hold is a single candlestick pattern basically a Black Opening Marubozu that occurs in an uptrend. It opens on the high of the day and then prices begin to fall during the day against the overall trend of the market which eventually stops with a close near the low leaving a small shadow at the bottom of the candle. If longer bodies characterize the Belt Hold then the resistance they offer against the trend will be even much stronger. 2. The market gaps up and opens at its high and closes near to the low of the day. 3. A long black body that has no upper shadow (a Black Opening Marubozu) is observed. A Black Opening Marubozu or a Black Marubozu (with no upper or lower shadow) should be seen and it should open higher than the two preceding white candlesticks. 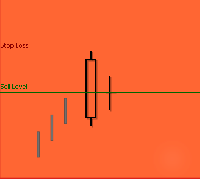 This four candlestick pattern starts with a strong white candlestick. The next three days after the upside gap set consecutively higher prices. However the last day completely erases the limited price gains of up days and closes inside the gap between the first and second days. This suggests a short term reversal. 1. The color of the first strong white day represents the current uptrend. 2. The second day is also white and the body gaps in the direction of the trend. 3. The third and fourth days continue the trend direction. It is better if the third day is black but it may also be white as the fourth day. 4. The fifth day is a black one that closes inside the gap that is formed between the first two days. 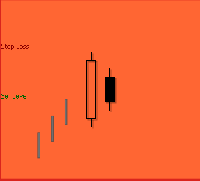 The first white candlestick of the Bearish Breakaway should not be short. However the following three white candlesticks after the gap can be short while the third candlestick in the middle can be black too. The last black day should close inside the gap but should not fill the gap. 2. A white body is formed observed on the first day. 3. The black body that is formed on the second day completely engulfs the white body of the preceding day. The length of the first white candlestick is not important. It can even be a Doji. The second one however has to be a normal or long black candlestick. 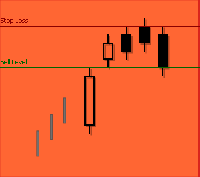 Either the body tops or the body bottoms of the two candlesticks may be at the same level but in any case the black body of the Bearish Engulfing Pattern should be longer than the previous white body. This pattern consists of a white body and a small black body that is completely inside the range of the white body. If an outline is drawn for the pattern it looks like a pregnant woman. This is not a coincidence. This is a major bearish reversal pattern which is even more significant than a regular Bearish Harami. The outline again looks like a pregnant woman as with the Bearish Harami Pattern. However now the baby is a Doji. Basically the pattern is characterized by a white body followed by a Doji that is completely inside the range of the prior white body. 2. A white body is observed on the first day. 3. The Doji that is formed on the second day is completely engulfed by the body of the first day. The Bearish Harami Cross consists of two candlesticks in which the body of the first white candlestick engulfs the body of the following Doji. The body of the first candlestick may be short.